Roasted almonds are slightly harder in texture than natural almonds because the dry-roasting process removes some of the moisture. Natural almonds are better for baking and cooking. There are about 23 almonds per one ounce serving. 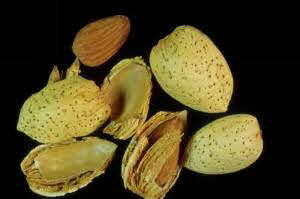 Shelled whole dry-roasted and shelled whole natural almonds are packed in 2-pound cartons. • After opening, almonds will keep 4 to 6 months under refrigeration. • Opened nuts, if frozen, will keep for 9 to 12 months. • One pound of whole almonds measures 3 cups. • Dry-roasted almonds have a shorter shelf life than natural almonds. • Almonds can be substituted in any recipe calling for nuts. • Almonds are a tasty and nutritious addition to rice dishes, vegetable dishes, casseroles, stuffings, salads, baked goods and desserts; they also make an excellent substitute for bread crumbs as a topping for casseroles or in a breading for fish. • To toast almonds, spread in a single layer on a baking pan and bake at 300-350°F for 8-10 minutes, stirring occasionally until almonds darken slightly (they will continue to brown slightly when removed from the oven). • Shelled Almonds are a vitamin E-rich food; because of their skins, they are even higher in vitamin E than blanched almonds. One ounce (about 20-25 almonds) provides 35% of the daily value for vitamin E.
• Almonds are also high in protein, having as much protein, ounce for ounce, as red meat, but without the cholesterol. • The fat content in almonds: 72% is monosaturated (the “good” fat), 21% is polyunsaturated fat, and only 7% is saturated fat. • 1/3 cup of almonds provides 1/3 serving from the Meat, Poultry, Fish, Dry Beans, Eggs, And Nuts Group of the Food Guide Pyramid.